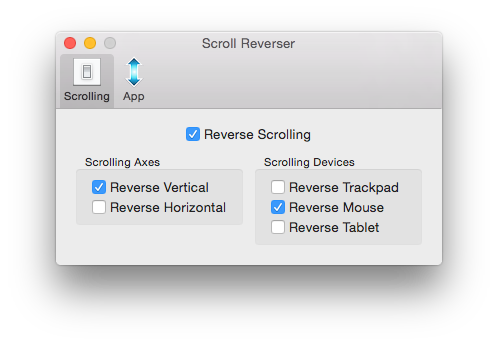 Scroll Reverser is a free Mac app that reverses the direction of scrolling. It is available for macOS 10.4 onwards. It has independent settings for trackpads, mice and Wacom tablets, and for horizontal and vertical scrolling. Scroll Reverser was made by Nick Moore and other contributors. The source code is available. To get in touch, contact feedback@pilotmoon.com or tweet @pilotmoon. Please also check out my other apps. Scroll Reverser is completely free of charge. However, if you wish to make a voluntary donation you can do so below. It doesn't detect my trackpad. If you have an older Mac without a multi-touch trackpad (late 2007 and earlier) then Scroll Reverser will see your trackpad as a mouse. This also affects some Logitech external trackpads. I know of no fix. Can you make it reverse 3- and 4-finger swipes too? No, this is not possible. However, swipe direction respects the "Scroll Direction: Natural" setting in System Preferences. Set that to your liking, then use Scroll Reverser to adjust scrolling with respect to that base setting. Can you make it reverse scrolling on volume sliders? No, this is not possible. I am controlling a machine via remote desktop, and Scroll Reverser is running on both the local and remote machine. Anything I can do to make it work nicely? Run this command at terminal on the remote machine: defaults write com.pilotmoon.scroll-reverser ReverseOnlyRawInput -bool YES then quit and restart Scroll Reverser. Translation updates, including a new Norwegian translation (thanks, Patrick). Notification center getting stuck half-open while Scroll Reverser is running. The relaunch-on-wake implementation is now more robust. A small correction to the Polish translation. Fixed a bug where, on unchecking "Show in menu bar", the "Icon Hidden" message would appear multiple times. You can now right-click (or control-click) the menu bar icon to toggle Scroll Reverser on/off. New algorithm to (hopefully) distinguish more accurately between trackpad and mouse. Added a debug console to help with fault-finding. To show the debug window, option-click (⌥-click) the Scroll Reverser menu bar icon. Fixed bug (introduced in v1.7) where Scroll Reverser would sometimes stop working after using it for a while. Brand new preferences window to replace the clunky old menu. Important fixes for compatibility with the upcoming Yosemite update 10.10.2. Adds AppleScript support for turning Scroll Reverser on and off. Now treats a Wacom mouse's scrolling as coming from a mouse, rather than a tablet. Gave the app icon a freshen up. Updated the status icon for retina displays. Added the option to automatically check for updates. Fix minor bug which casused a console warning about 'scrollPhase is deprecated...'. Signed with a Developer ID for OS X 10.8 Gatekeeper. Now works with OS X 10.4 Tiger. More reliable detection between mouse and trackpad. Fixed a bug that led to high memory usage. Added a welcome window that appears on the first run. Fixed a problem with the Italian localization. Changed default on Lion to not reverse horizontal scrolling. Restored PowerPC and 32-bit Intel support. Added independent settings for horizontal and vertical scrolling. Added independent settings for scrolling with trackpad, mouse and Wacom tablet. Fixed a Firefox compatibility problem. Dropped PowerPC and Intel 32-bit support (by mistake). Added option to hide the menu bar icon.